John Trefts has been a foremost figure in the iron industry of Buffalo for half a century. He lived in Pittsburg when a young man, and learned there the trade of an iron molder. His long residence in Buffalo began in the year 1845, when he took charge of the foundry department of the Buffalo Steam Engine Works. He remained with this concern and its successors nearly twenty years, acquiring stock in the company, and taking an important part in the business. The panic of 18o7 brought disaster to the Buffalo Steam Engine Works, as to thousands of other concerns; and the business was reorganized under the style of George W. Tifft, Sons & Co. Mr. Trefts remained with the new firm seven years, and contributed very materially to the success of the business in that period. Chiefly through his skill as an iron worker and knowledge of iron ores, the Tifft firm was able to carry through profitably in l860 a contract for the manufacture of the rails used in laying the first street railway in Buffalo. A greater degree of historical interest attaches to Mr. Trefts's connection with the petroleum industry. Soon after Colonel E. L. Drake "struck oil" in August, 1859, near Titusville, Penn., and thereby set in motion one of the greatest industrial forces of the century, Mr. Trefts interested himself actively in the oil business both as an operator and as a manufacturer of mechanical appliances used in the production of oil. He made the castings for the engine used to pump the Drake well. In 1860 he associated himself with P. S. Willard, and leased a part of the Shaffer farm, not far from Colonel Drake's original discovery. In operating their well here they used the first engine that ever drilled with a rope, as well as the first set of jars ever employed in oil production. These jars were invented by Mr. Willard, and were ill adapted to their purpose, so that the well was not a success, resulting in a "plugged hole." Relic hunters interested in the subject may pleasantly employ themselves in excavating these jars, as they are still in their untimely grave, buried under $1800 worth of experience. Mr. Trefts's next venture was on the Ham McClintock farm, near Oil City. In attempting to drill this well his workmen became discouraged, and were disposed to abandon operations, so that Mr. Trefts took charge of the work personally. After dislodging three sets of tools left in the well by former drillers, he vindicated his faith by discovering a well that yielded 200 barrels of oil a day. A few weeks after this he succeeded in completing the well-known Van Slyke well on the Widow McClintock farm. He had no interest in this well, which was owned by John Van Slyke and C. M. Farrar. Work had been abandoned on the well, but Mr. Trefts felt so confident that oil could be found there that he undertook further explorations at his own expense. His judgment proved excellent, as the well produced 200 barrels of oil a day. These ventures in the oil country had not interfered with Mr. Trefts's regular occupation at the Tifft works in Buffalo. On the contrary, his experience as an actual producer of oil helped him materially in later life as a manufacturer of the various machines used by oil operators. In other parts of the business as well Mr. Trefts was accordingly, with Chillion M. Farrar and Theodore C. Knight, under the style of Farrar, Trefts & Knight, for the purpose of establishing a foundry, machine shop, and general iron works. In 1869 Mr. Knight retired from the firm; but the other partners, under the well-known style of Farrar & Trefts, have carried on the business ever since. Their resources at first were slight; but their experience, energy, and character ensured ultimate success. The business expanded year by year until now the firm is known throughout the iron trade as one of the most successful concerns in its line in the country. Boilers of all kinds, propeller wheels, steam engines, iron and brass castings, and a multitude of special mechanical appliances used in various industries, are some of the famous " F & T." products. The works of the concern occupy three acres of valuable land in Buffalo. JOHN THEFTS, whose lamented death occurred on the 5th of October, 1900, was for more than fifty years one of the foremost men in the iron industry of Buffalo. He was the son of George and Katharine (Frizel) Trefts, and was born in Alsace, then a province of France. He came to this country with his parents about 1819, the family settling first in Pittsburg, Pa. Later the father placed his family and goods on one of the "prairie schooners," and began the long journey to a farm in Southern Ohio. But he died on the way, and his son, John Trefts, turned the team eastward, and drove back to Pittsburg. There he gained his first knowledge of the iron industry, where he learned the trade of a moulder. In 1845 Mr. Trefts came to Buffalo, where he became a foreman in the Buffalo Steam Engine Works. He remained with this concern and its successors nearly twenty years, becoming a stockholder of the company and a leading factor in the business. After the panic of 1857 the firm was reorganized under the style of George W. Tifft, Sons & Co. In 1859 Mr. Trefts became interested in the oil business in Pennsylvania, both as an operator and a manufacturer of mechanical appliances for use in oil production. He made the castings for the engine used to pump the Drake well, the first one sunk in the oil region, and in operating a well in which he was part owner he employed the first engine that ever drilled with a rope, as well as the first set of jars ever used in oil production. Mr. Trefts was successful in various ventures in the oil country, and had an important share in the pioneer oil development of Pennsylvania. In 1864, with Chillion M. Farrar and Theodore C. Knight, Mr. Trefts established in Buffalo the firm of Farrar, Trefts & Knight. This was the beginning of the great iron industry of Farrar & Trefts, which name was assumed on the retirement of Mr. Knight from the concern in 1869. With this firm Mr. Trefts was identified up to his death. Mr. Trefts was married first to Catherine Potter in 1848. She was a daughter of Martin Potter of Gowanda, N. Y., and came of the well-known Parkinson family of New England, being a descendant of Capt. Parkinson, who served in the Revolutionary War. Mrs. Trefts died in 1850 and Mr. Trefts married for his second wife Angeline Siver of Buffalo. 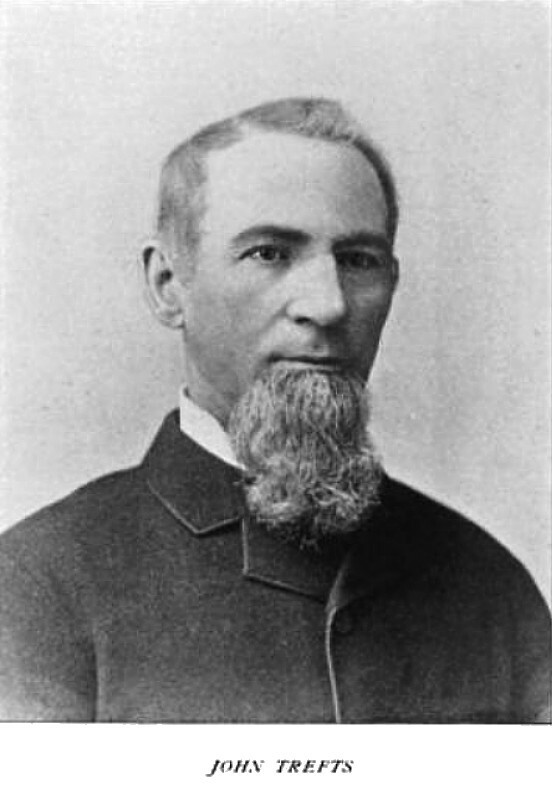 George M. Trefts was the only child of the first marriage. A daughter, Evadne, now Mrs. Clarence E. Rood, was the child of the second union.